By Whit Beverly, President of Aztec Products, Inc. In commercial cleaning today, everybody wants the job done quicker and “greener.” A contractor who asks the store manager whether they want the store done more quickly or more “greenly” would probably get told to do both. The contractor may even be told that if they can’t do both, the manager will find someone who can. Given that reality, the contractor’s only choice is to maximize efficiency. 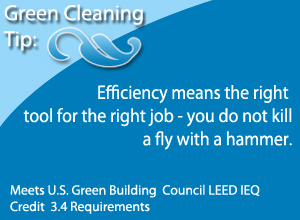 Efficiency means the right tool for the right job—you do not kill a fly with a hammer. For example, when choosing cleaning chemicals, you should choose one just strong enough to do the job quickly and completely. Too much or too strong, and the chemical will leave dangerous residue or affect indoor air quality. Similarly, an alternative chemical that is too weak might be “greener” but if much more needs to be used to do the job, or it takes twice as long to apply, too much is spent in material or labor, eliminating your green benefit. The process for making the batteries the car uses is so environmentally dirty that only two companies in the world will do it. The batteries only last 6-8 years then need to be replaced, filling landfills with heavy metals. 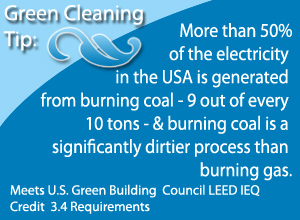 More than 50% of the electricity in the USA is generated from burning coal 9 out of every 10 tons and burning coal is a significantly dirtier process than burning gasoline. 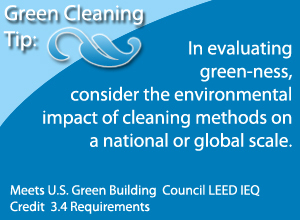 Therefore, when one considers greenness, they should consider environmental impact at the point of work, the financial impact of the method of cleaning to the contractor or facility and the larger environmental impact / carbon footprint of that method on a national or global scale. Propane Burnishers for flooring are made to maximize efficiency and minimize waste. They are extremely fast and – contrary to popular belief – very green. The new generation of propane burnishers are the greenest machines on the market based on emissions, labor requirements and purchase price. Let’s start with the purpose of a burnisher. Its purpose is to shine the floor. 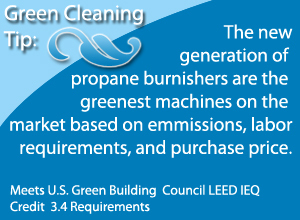 According to The Official ISSA 447 Cleaning Times, a propane burnisher will shine a floor at 19,355sqft/hr. The production rate of a 2000 rpm corded electric machine is 8,333sqft/hr or less than ½ the speed of the propane assuming that you do not have to continually stop, unplug the machine and find another plug while you are working. Practically speaking, a propane burnisher is usually considered to be at least 3x the speed of a corded electric. A battery machine will do 9677sqft/hr or exactly ½ the speed of the propane. Because there is no need to worry about cords, this work rate is accurate. Based on the above, it would take two battery powered machines or three corded electric machines to do the same job. Battery burnishers run about $6,000 each, corded electrics $1500 and propanes $2000. 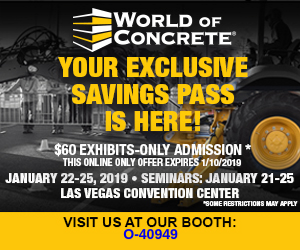 So if you wanted to shine about 20,000sqft/hr, the machines would cost you $2000 with propane, $4500 with corded electric and $12,000 with battery burnishers. Ideally you would be able to stretch the life of the machine to 6 years with any of these machines, but a hidden charge where the battery machine is concerned is that over 6 years you should expect to go through 3 sets of acid lead batteries. They end up in land fills. They also cost about $2000 for a set of 6 batteries. Let’s talk about labor. The propane burnisher takes one man to shine the floor at 20,000ft.hr. For a 60,000sqft store, 3 man-hours at a $15/hr labor rate it costs you $45. The corded electric takes you 9 man-hours or $135. Battery burnishers take you 6 man-hours or $90. When you look at stripping floors with propane versus these other methods the numbers are even more staggering. 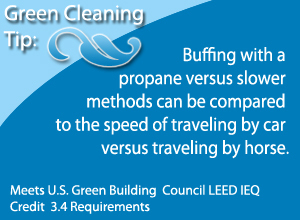 Buffing with propane versus these slower methods can be prepared to the speed of traveling by car verses traveling by horse. Continuing this analogy, stripping floors with propane machines is like traveling by jet. If you have never seen it and are used to corded machines, you need to see it to believe it. Let’s talk about emissions. Obviously there are no emissions from corded electric machines. However, as previously mentioned, more than 50% of the electricity in the US is generated from very dirty coal burning plants. Burning coal for electricity is a major contributor to greenhouse gasses, global warming and acid rain. Using electricity is creating the demand to burn more. Contrary to popular belief, there are emissions from battery powered machines, not when they are being used, but when they are charging. Lead acid batteries vent fumes when they charge and given what the batteries are made of, you can guess what is in the fumes. Propane machines also create emissions. In their case it is very low levels of carbon monoxide. The vast majority of propane burnishers made by responsible companies use catalytic converters to mitigate and chance of problems with carbon monoxide. Like in an automobile, these catalytic converters change carbon monoxide to carbon dioxide. The Environmental Protection Agency (EPA) and the California Air Resources Board (CARB) very carefully regulate the use of propane indoors. Each manufacturer of propane equipment is required to submit their propane engine to be tested and approved. Once it is approved the manufacturer is required to make every future engine the same way and to test the emissions on each new machine before it leaves the building. Spot tests of well-maintained propane machines in grocery stores usually find that the bread machine in the store bakery has significantly higher emissions than the propane burnisher. In addition to these standard features, most manufacturers offer some enhanced safety features as options. An overfill protection tank is an option to make sure that your propane tank does not get overfilled, resulting in liquid (rather than gaseous) propane entering the regulator and freezing the diaphragm. An emergency cut-off switch can be installed that works much like one on a jet ski breaking the electric circuit if the operator loses contact with the machine. An electric clutch can be installed which does much the same thing, but cuts power to the pad (not electricity) when the user releases the handle. Last but not least, an O2 sensor can be installed to actively monitor emission levels and cut of power to the machine if something happens to the machine cause emissions to rise to unsafe levels. Just like in so many other areas of life, the people who talk the loudest are usually trying to sell you something. Green cleaning is very important, and the technological advances that have been made with chemicals and ionization processes are truly amazing. Equipment salespeople though, like debaters, tend to only give you the facts that strengthen their own case. They are paid to convince you to change to their products. Do your own homework and make sure to take into account labor requirements, new parts replacement cost and old parts disposal expense both to you and to the environment. You may find that the best “newest and greenest” way to take care of your floors is the way that you have been all along.